Republican presidential candidate Mitt Romney has pulled even with President Obama following the first presidential debate. According to a new Gallup poll, registered voters' preferences are evenly split and Obama had carried a five-percent lead before the debate. Obama held a 50 percent to 45 percent edge over Romney from September 30 to October 2, the poll shows. But in the three days following the debate, from October 4-6, they were tied at 47 percent. The poll also shows that the overwhelming number of people who watched the debate, 72 percent, thought Romney did a better job. 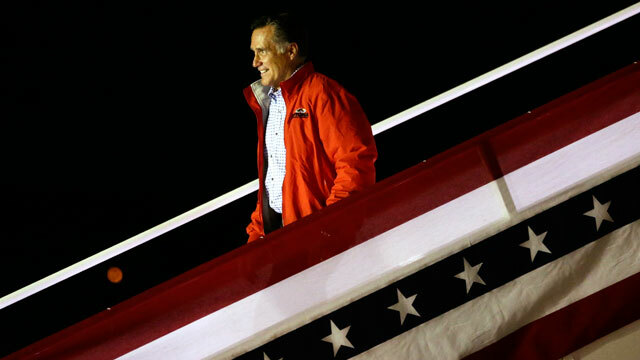 Even Democrats agreed Romney performed better by a margin of 49 percent to 39 percent. Only 20 percent of debate watchers thought Obama performed better. Romney's 52-point win is the largest margin Gallup has ever measured. The previous record, according to Gallup, was Bill Clinton's 42 point lead over George H. W. Bush in a 1992 town hall debate. While the poll shows Obama leading Romney 49 percent to 46 percent overall, the breakdown between pre- and post-debate margins indicates the debate may have given Romney a bounce. Gallup indicates, however, that the positive jobs report - unemployment dropped below eight percent for the first time in nearly four years - may "blunt" some of the momentum Romney gained following the debate. A separate poll showed that Latino voters' views of the candidates remain relatively unchanged. Obama leads Romney among Latino registered voters 72-20 percent, according to the latest survey from Latino Decisions, a political opinion research firm. That poll was only in the field for one day following the debate, so we will have to wait for future numbers to see if there was any shift among Latinos. There are two more presidential debates to come - October 16 in Hempstead, New York, and October 22 in Boca Raton, Florida. Vice President Joe Biden and Romney's running mate Paul Ryan will debate October 11 in Danville, Kentucky. A separate poll conducted by the Pew Research Center showed Romney jumping out to a four-point lead over Obama (49-45 percent) among likely voters surveyed after last week's debate. That's a 12-point swing from September's Pew poll, which showed Romney trailing Obama 51-43 percent. Among all voters, 66 percent said Romney performed better during the debate compared to 20 percent who thought the president won. Romney benefitted from a massive surge in support among women voters: he erased an 18-point deficit with women, who now split their support 47-47 percent between the two candidates. He also made up ground against Obama among young voters. Voters ages 18-29 said they support Obama 58-42 percent in October, compared to a margin of 65-32 percent in September. The poll has a margin of error of 3.4 percent among likely voters, meaning that Romney's margin is just enough to be considered statistically significant. Still, with such a large shift in support it will be interesting to see if other polls confirm whether this result is a trend.